How brave are you? 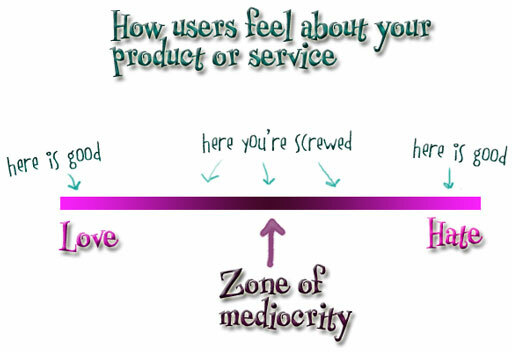 How far will you (or your employer) go to avoid the Zone of Mediocrity? Until or unless you're willing to risk passionate hate, you may never feel the love. Scott Adams agrees. In a recent post on the Dilbert blog, he said, "If everyone exposed to a product likes it, the product will not succeed... The reason that a product “everyone likes” will fail is because no one “loves” it. The only thing that predicts success is passion, even if only 10% of the consumers have it." This is NOT about being remarkable-- it's about being loveable. And that almost always means being hated as well. Our Head First Java book, for example, has 139 Amazon reviews, and most are either five stars ("love it, best technical book ever, I learned a lot") or one star ("hated it, worst technical book ever, authors should be shot.") But crafting a book that people would either love or hate was not our intention. We set out to make a more brain-friendly learning book format, and we were just clueless and naive enough to not realize how many implicit "rules" we were violating. It wasn't until O'Reilly editors started a mini revolt against it that we knew we'd crossed a Line That Shall Not Be Crossed and created something potentially embarrasing. Today, it is often far more risky to create something "safe" than to take a big frickin' chance on something deeply provocative, dangerously innovative, or just plain weird. Think about all the things you love today that once seemed very, very weird. Things that someone took a huge frickin' chance on. Today, the more you try to prevent failure, the more likely you are to fail. That wasn't always true, but geez... how many more [whatevers] do we need today? There are way too many of all the things we already have and not enough introductions of things we don't have. We all know the reasons why companies play it safe, and why employees are often forced to play it safe, but this me-tooism isn't helping anyone. What does it take to move out of the Zone of Mediocrity? To avoid the Zone of Mediocrity, you must suspend disbelief. And it's not just suspending disbelief about what users (or critics) will say... you must also suspend disbelief about what your company will let you do. I first experienced this at Sun, where it was almost impossible to creatively brainstorm about ways to improve things without someone jumping in with, "Yeah, but they'd never let us do that." End of discussion. End of chance to do something amazing. Every time I do an internal workshop, the partipants are far more negative than when some of those same people are in a public version of my passionate users workshop. By taking them outside their company and having them brainstorm or work on fictional or other people's projects, their minds are free to move about. I've nearly quit doing in-house workshops because the "they'll never let us do that" syndrome is so strong. And one more follow-up note: I heard from the guy who designed the Airstream 75th Anniversary Trailer (wow -- if ONLY I could afford that one, it would have been my first choice). His studio builds custom and restored vintage trailers, and even if you don't want one now, you should still check out his Vintage Trailering site just to see his work. There's nothing mediocre here! You first sentence holds the secret to dealing with this. How brave are you? Do you remember when you where a child and you had no fear? You had an idea, you went with it, simple. When did we learn the fear? Which sick SoB taught us to shut down our creative juices to fit the norm? To be part of the zone of mediocrity? Now we have the tools and skills necessary to create the (fill in name of new product here), but are not brave (or naïve) enough to try and create it. Strange world, huh? Maybe it is too late for our generation, except for Kathy’s readers who know the secret ;), but keep your kids away from the zone of mediocrity… please! As an educator with a few older books that took multiple intelligences into account I have been fascinated with the Head First books from the first moment I heard about them. There is an entrenched notion that technical books must be serious in tone that you're up against. The number of "love" and "hate" responses you've gotten should tell you that you're doing something right! I wish more educators were listening to you. I love to read your articles but now I am thinking what you could do to make this blog even more usable. I came to this blog because I remember one great picture "dog and plastic puppy" something what user wants and what really gets. I had one of my executives on IM and I wanted to share article. Pity, I could not find it... I found it later in easy-to-use article but now I do not need it. Main problem is navigation. Search may help, even Google site search or I do not know does technorati offers site search service. Next great web20 invention is tagging. You should tag all your posts by topic. If I would have tag "easy-to-use", "design-mistakes" or something like that what would be associative with that post I would probably find it. Third thing, your blog shows full articles one under the other, no archive list with only title, maybe one picture and introduction... something like first 350 characters of the post. Even that would help more then list of "recent articles" from the right. This time I searched for recent article but what if I would like to find something from last year but I have no idea which time only I know it is image of dog and plastic toy and how we destroy our product trying to make it easy to use... no chance. That calendar does not have navigation and it is totally useless. I may bet that nobody ever clicked on some date just to see that did you write on October 8th 2006. That information is totally irrelevant. I know that you use typepad and you are limited with platform itself but this is thing that would really help. You do not have to publish this comment, I write it to you but as you wish. Sorry, I was really pissed off because I could not remember title of the post, could not find it in Thunderbird because feeds were messed up bunch of HTML code and on blog practically without navigation. OK you could send my notes to those people that run your blog platform and maybe you could do something with it. Reading on your blog is awesome just continue to write please I need exactly that as reminder and inspiration. I couldn't agree more. At some point my screen saver showed the following message "Those who say it can't be done shouldn't bother those who are actually doing it". Kathy, your blog is becoming really a guide to me and I often refer to your articles while attending to my project. As you almost always write long articles, they should fit nicely inside a book or, at least, inside a downloadable pdf. It would be nice to have a "passionate reference" to your thought. I start seeing a coherent philosophy behind and this is really amazing! I agree with the gist of the post, but you really didn't go quite far enough when you said, "Today, the more you try to prevent failure, the more likely you are to fail." I'm quite certain that should read "If your ultimate goal is to prevent failure, you will ultimately fail." You could add "with a whimper," or "in a boring, protracted, blame-filled miasma" or something like that. Or just "Defense never won a ball game." and then add "or sold many tickets, either." "Put [it] on trial for its life. Ask it to defend itself. Show no mercy. Make it beg, make it plead [...]. If it doesn't convince you, kill it"
Just like everyone who tried new coke in test cases liked it. It was going to be a bonified hit! That's why I say you should embrace hatred of your product. Another good article with a great graphic. What software tool(s) do you use to create these pictures, and how can we learn to do the same? You may disappoint some people by your ideas, concepts or products, but they are not your target. Focus on your real one, and you will have many of them (maybe not all of them). Create something that people love or hate. Don't create mediocrity. Kathy - this thought also applies to everyone in their careers and how they manage them. If you carry on doing the same old, same old then you are destined to a job that will be purely that 9-5 syndrome and you will be one of the majority feeling dis-engaged about work. Peters talks about delivering WOW. Buckingham & Clifton talk about focusing on your strengths - the majority of North Americans still beleive they will be more successful by working on their weaknesses. As Buckingham has often said what is the point of raising your weaknesses to a point of mediocrity when you can capitalise on your strengths and be way more successful?. If you are considering moving your career from mediocrity take a moment to reflect on your personal brand - what are the skills and attributes you have that make you different and stand out? Look to appoint the VP's of your life - Vision, Purpose, Values & Passion and connect to them everyday - you wil soon find out if you are in a job you love or hate. Kathy, we took your advice, and painted our house purple. You are right. People love it, people hate it. The strong reactions on both sides can be a bit of a strain on the psyche, but we definately got noticed. Here is the result: http://www.washingtonpost.com/wp-dyn/content/article/2006/10/02/AR2006100201424.html. (The photo doesn't do justice to just how purple it is). I loved the book "Head First Design Patterns", it taught me to OOP and I can't even speak Java (I'm an ActionScript developer). Though when I first got it, I was a bit "wtf is this?" so I think it's important to remember you're not only up against your own preconceptions of what can be delivered but also those of your audience/ customers as to what they expect to be delivered. If people just plain don't know what it is, they'll never love it or hate it. I work in the church world and this is so applicable to us. Most churches live in the Zone of Mediocrity and are very comfortable staying there. Every once in a while they wonder why they've lost their influence and why no one is passionately in love with their organization. A few seconds later they realize the Zone is easier and return to it. Trying to have a church that is loveable is a risk because there will be people who hate it because it is too different and they don't understand it. For us, it is about being brave. We have to ask ourselves daily, "Are we going to be brave today?" There's nothing wrong with praying for bravery...but be ready for the opportunities that will come. Perhaps it is society's dependancy on Market Research - and Covering Ourselves that makes being SAFE a priority. Thinking about the latest waves to hit the web like: youtube and Digg - they went with their gut feelings and passions. While many of the larger companies would never consider that until there was a proven ROI. Now everyone wants to acquire the successes - AFTER - they have been proven. :-? Great post and wonderful insight. Keep it up. Well, from here in the zone of mediocrity, a bureaucratic government agency, one can only dream! THe good news is that there is life beyond the 9-5.
hi Kathy - stumbled into your blog today via gapingvoid. (I promise I didn't really expect to see you naked.) Rather, I've found that Hugh's links can lead to interesting places, like this one. I'm finally getting my head around this. I COULD NOT AGREE MORE, HOWEVER ITS NOT AS EASY FOR ANYBODY TO HAVE NOT ONLY THE DISIRE TO RID THEIRSELFS OF MEDIOCRITY, BUT MORE GOES INTO IT THEN JUST TELLING THEIRSELF THEY CAN DO IT. THE "FEARFACTOR" PLUS THE EXTREMELY DEEP DESIRE TO BE STRONG ENOUGH TO CHANGE THEIR CURRENT POSITION IS ALMOST A WORK OF ART. EVERYBODY KNOWS HOW HARD IT IS TO QUIT SMOKING, WHICH IS A DESIRE IN THE BRAIN, BUT NOT A DEEP ONE. IMAGINE WHAT ITS LIKE TO TELL SOMEBODY THAT ALREADY HAS PROGRAMMED THEIRSELF TO LIVE A MEDIOCRE LIFE TO CHANGE ALL THAT IN THEIR HEADS. YOU SAY JUST "SHUT DOWN" THE PART THAT TELLS YOU YOU CAN'T DO SOMETHING. IF ANYBODY COULD CHANGE ON SUCH A SHALLOW LEVEL AS THAT, THEN NOBODY WOULD HAVE ANY VICES, AND EVERYBODY WOULD BE AS CREATIVE AS THEY ARE INSIDE. IT TAKES WORK, HARD WORK ON THE BRAIN TO CHANGE. NOT COMPLICATED TO SAY, BUT HARD TO DO. FEAR AND BEING WEAK ARE THE BIGGEST DRAWBACKS ON ANYBODY SUCEEDING. NO JOKE. UNLESS YOU ALREADY HAVE A NATURAL STRENGTH, (BLESS YOUR HEART) THEN YOU ARE ONE STEP AHEAD OF MOST OF THE PEOPLE. BEING WEAK CAUSES CONFUSION. HOW MANY PEOPLE HAVE WANTED TO DO SOMETHING BUT DON'T BECAUSE THEIR JUST "TO TIRED". IN THE NEXT BREATH THEY "DECIDE THEY BETTER DO SOMETHING" OR THEIR GOING TO GET BORED. THEY MIGHT THINK THEIR "STRONG", BUT THEIR NOT. STRENGH COMES FROM GETTING UP AND DOING WHAT YOU WANTED TO DO IN THE FIRST PLACE. NOT "DOING SOMETHING LATER" THAT THEY DIDN'T REALLY WANT TO DO, BUT "HAD" TO DO SOMETHING. THE BRAIN NEEDS TO BE REWIRED IF PEOPLE REALLY WANT TO SUCEED IN WHAT THEY REALLY WANT TO ACCOMPLISH. AND IT DOES TAKE WORK!! IF THEY CAN DO THINGS TO KEEP FROM BEING BORED, THEN THEY NEED TO REDIRECT THEIR THINKING FROM WHAT THEY DO THAT DOESN'T INSTILL FEAR, TO WHAT THEY WANT TO DO THAT REQUIRES THEM TO DEAL WITH THE FEAR OF DOING IT. WHICH AGAIN TAKES US BACK TO BEING STRONG AND FIGHTING THE FEAR. MAYBE THE FEAR DOES COME FROM THEIR ENVIORMENT, BUT THEY NEED TO CONCERN THEIRSELF WITH THEM, AND NOT WHAT THEIR ENVIORMENT HAS TO SAY. ITS NOT JUST IGNORING THEIR SURROUNDING, AS MUCH AS IT IS BEING SELF-ABSORBED AND SELF-INVOLVED. I KNOW I SAID THE BAD WORDS, BUT IF YOUR NOT GOOD FOR YOURSELF, THEN YOUR CERTAINLY NOT GOING TO BE GOOD FOR ANYBODY ELSE. THAT PRETTY MUCH PERTAINS TO LIFE IN GENERAL. "I LOVE YOU BUT I LOVE ME MORE" IS NOTHING TO BE ASHAMED OF. A PERSON WILL ENCOURGE THEIR BEST FRIEND TO DO "THE RIGHT THING" BEFORE THEY WOULD TAKE THEIR OWN ADVICE, AND AS FAR AS I'M CONCERNED, LIKE YOURSELF, NOT IN A NARCISSIC WAY, BUT TAKE AN INTEREST IN YOURSELF, IF PEOPLE LIKE YOU, THEY LIKE YOU, IF THEY DON'T, YOU WEREN'T PLANNING ON BEING PRESIDENT ANYWAY.